Model trains come in many different sizes, called “scales.” The scale of a model is its relative size in proportion to the real thing (called the “prototype”). For instance, HO scale models are 1/87th the size of the real thing. If you had an HO scale model of a forty-foot boxcar, you would need 87 of them to match the length of the real thing. The distance between the rails is called the gauge. In the real world, “standard gauge” is four feet, eight and a half inches inside-to-inside between the rails. In the model world, HO trains run on track gauge that is only .625″ wide, scaled down from the real thing. Why are there so many different scales of model trains? The history of model trains stretches back nearly 150 years, almost as old as the railroad industry itself. The first models were not constructed to any one scale or standard, as were more like toys without any way to have different trains working together. 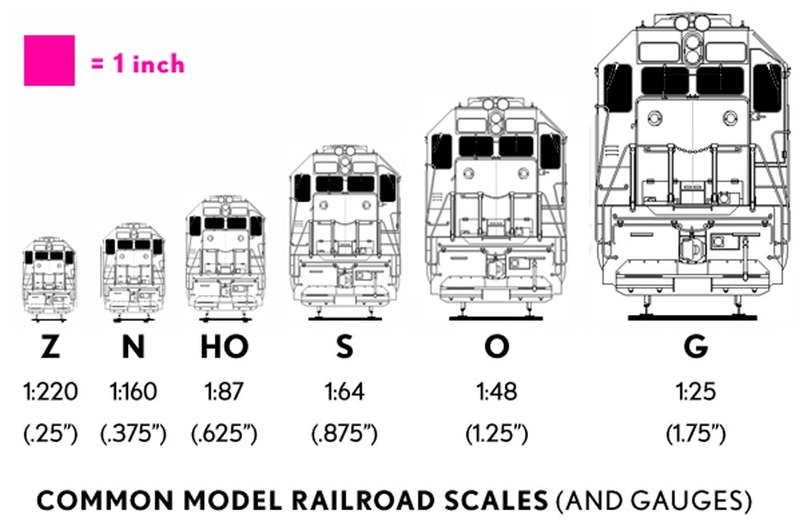 As standards were set for toy trains, manufacturers chose to build to common scales, some of which are outlined below. G scale trains were introduced by Lehmann Grosse Bahn (which translates into “Lehmann Big Trains”) in the 1960s. Because of its size and durability, these rugged toy trains are often used in outdoor garden railways, where hobbyists combine their love of trains with beautiful gardens and real scenic elements such as ponds and waterfalls. While the trains are fun to play with, even the smallest set-up will take up a lot of room. Options for different trains and accessories are limited as well. Depending on the manufacturer, G scale model trains range in scale from 1:24 to 1:32, but generally run together on the same gauge track. At the turn of the last century, Lionel was the first to produce electric toy trains in America in what they called “Standard Gauge,” where the rails were 2.125″ apart. After the first World War, the smaller O scale (1:48) became the popular size for toy train manufacturers in America. Many toy train sets run on three-rail track, which allows for complex track layouts to be built without complicated electrical wiring. Lionel continues to make O scale trains and accessories, along with a number of other manufacturers like Atlas, MTH, and Williams. The period between the first and second World Wars saw the rise of smaller model trains, starting with S scale (1:64) in the 1930s, popularized by American Flyer Trains (made by A.C. Gilbert Co.). These trains became popular because they ran on more realistic-looking two-rail track instead of the three-rail system used by competitor Lionel. While many collect vintage American Flyer trains, there are many manufacturers making modern S scale products today. Selection of trains and accessories can be limited, but some hobbyists enjoy the challenge of building their own models from scratch and improvising from parts. HO scale (1:87) made its first appearance in Europe before becoming popular in the United States in the mid-1930s. The abbreviation “HO” stands for “half-O.” The smaller trains were less expensive and took up less space than their larger O scale cousins, which became popular with people who were moving into small homes and apartments in the 1940s. As manufacturing methods improved after the second World War, HO scale trains became popular for their finer detail and wide range of available accessories. The widest variety of trains are available in HO scale from hundreds of manufacturers in all price ranges. The first N scale (1:160) model trains were produced in Germany in 1962, but would not make their debut in America until 1967 when Aurora introduced their line of “Postage Stamp Trains.” The designation “N” is short for “nine,” referring to the 9mm gauge between the rails of N scale track. While these early efforts were crude by modern standards, many hobbyists were captivated by the small scale models. Anyone looking to create long main line railroad runs and sweeping scenic vistas without sacrificing space quickly adopted the smaller scale. Today, N scale is only second in popularity to HO scale, with a wide variety of trains and accessories available. The smallest practical model railroading scale was also developed in Germany. Toy manufacturer Marklin released the first Z scale (1:220) model trains in 1972, assigned the last letter of the alphabet since it was assumed no smaller trains could be made! When these trains were later imported to America, they were first dismissed as a novelty. However, as manufacturing processes improved and the tiny mechanisms became more reliable, they gained their own niche following. While the selection of trains and accessories can be limited, a number of manufacturers are dedicated to producing modern American-style Z scale trains. With the continued popularity of model railroading in America, hundreds of manufacturers large and small have contributed thousands of different trains and accessories in a variety of scales and price ranges. As the manufacturing process became more sophisticated, modelers began to demand trains that more accurately resembled the real thing. No matter what scale you choose, today’s model railroader can enjoy a finely detailed model that is “ready to run” right out of the box, accurate down to the last rivet. Less expensive models allow the modeler to add more detail as desired. You might be surprised as how good looking the most affordable models are today. 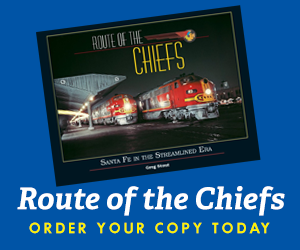 You don’t need to spend a lot of money to get maximum enjoyment from the hobby of model railroading!